VR headsets can get funky quickly if you don’t take care of them. The Lenovo Mirage Solo is the first standalone Google Daydream headset, letting you move around in a virtual world without needing to use your smartphone. All that moving around means the headset will get dirty if you don’t stay on top of cleaning it. Here’s how to clean your Lenovo Mirage Solo! The lens and cameras are the most important pieces of the headset, and the easiest to mess up if you’re not careful. Don’t use any detergents or alcohol on the lens or cameras, and don’t expose the cameras to direct sunlight when you let it air dry. Instead, just clean the lens with a damp cloth (use distilled water if you can), then wipe it dry with another cloth. Since the shell is hard plastic, it’s safe to use the alcohol wipes on it. Be sure none of the alcohol leaks onto the black area surrounding the cameras, then let it air dry afterwards. The facepad can’t be removed like on the Daydream View, but gently brushing with a nylon brush will get rid of most debris. If you need to use liquids, be sparse: dip the brush into a mild detergent solution, shake off the excess liquid, then brush the cloth pieces. When all is said and done, let the Mirage Solo air dry for an hour before using it again. Don’t expose the headset to direct sunlight — whether it’s drying or not — since this could damage the cameras. 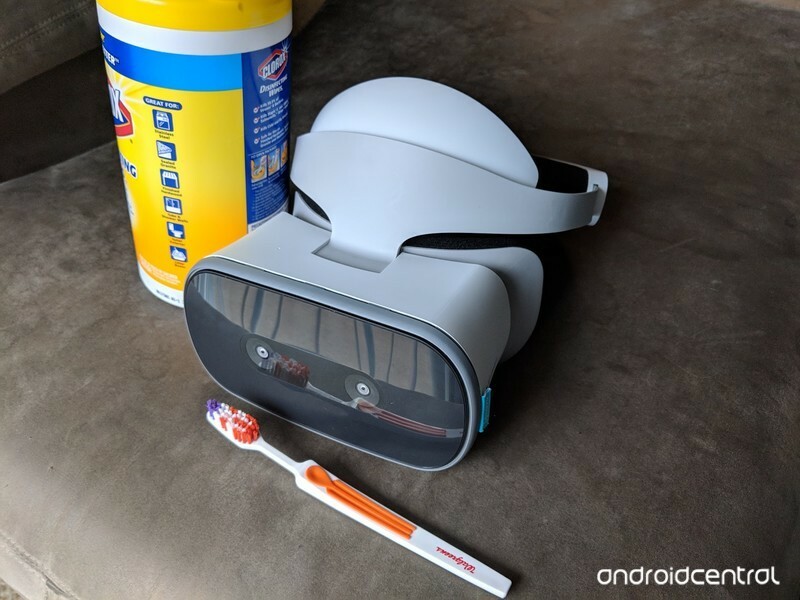 Cleaning a VR headset doesn’t take much work, but you need to be careful about what cleaning products you use on which pieces. Is there something we missed? Let us know down below!